What dog food is best for pitbulls? After so many years being involved in canine nutrition it almost seems inconceivable that this magnificent dog, the gladiator of the dog world while softer, sillier and more playful than many dogs, should be eating anything other than the diet they were born to eat. Look at those muscles, the sheer mass of canine beauty, that powerful jaw, the rugged stance and the instant determination to surmount any obstacle be it an 8 foot fence or hanging onto a swaying tree branch until commanded to let go… 20 minutes later! Ok so I haven’t got to the best dog food for Pitbulls part yet, but who’s in a rush here, lets wonder at your awesome dog. In fact allow me ask you, why did you get your pitbull? What is it about Pitbulls that attracts you? And what deep desire in you is being fulfilled by your dog? These are important questions because being partner to a dog like this takes deep responsibility, overcoming social stigma and having great heart, not to mention great leadership. While I’ve never been master to a pitbull myself I do have an English Staffordshire Bull Terrier who shares a similar lineage to your Pitbull. And so I have been fascinated by this gregarious dog for many years – one of my favorite dogs. Ok let’s get down to business, the dog food your pitbull should eat is a fresh raw food diet. To me it’s the go to option for ALL dogs and I’ll go into why in a moment but for the pitbull a healthy fresh raw food diet is an absolute must. The sheer mass of muscles and the work the dog has to perform be it general exercise or pitbull club meets cries out for quality nutrition. Here’s why? Pitbulls are born athletes and their need for the right fuel to burn as efficiently as possible while at the same time providing all the right biological processors in all the right places, at the right time and in concert with each other is vital to maximize health and mental wellbeing. A simple diet of raw food provides the natural synergy at a deep cellular level to heal, maintain and provide balanced energy, all the while firewalled by a robust immune system crucial to keep invading pathogens out and killing any that slip by. No commercial dog food can do this in any meaningful way and certainly not without side effects from the additives which short change the dogs immune system and shorten it’s life span. This I know 100% from many years of first hand experiential knowledge. If I compared commercial dog food and fresh raw dog food to cars, the commercial would be a 2002 Toyota Corolla (runs ok, needs comstant attention and only has a few years left before being scrapped) and raw is definitely a late model Chevrolet Camaro (runs like a dream, amazing power, looks awesome and has many years of prime time ahead). In a nutshell, kibble and canned pet food brands cannot give your dog what they need, in fact it’s impossible! Arguing that one brand of commercial dog food is better than another is just like saying that one brand of fast food is better than another brand of fast food when they are all the same cheap low quality additive ridden junk food. Think about this: Read any pet food label and you’ll see meat and animal derivatives or by-products listed early on. Do you know what they are? They are anything that’s left after what’s taken for the human food chain. Here’s a short list of what’s left, all legal and in the canned or dry dog food your giving your gladiator today. I’ll also include a small selection of the artificial additives included to preserve, color and enhance flavor. The above list is just a sample of what’s in commercial pet food in general. If the first ingredient on the label states whole grain corn, that’s the main ingredient in your dog’s dinner – corn! Not meat but corn. And your pitbull has no dietary need for carbohydrates. Their liver derives energy directly from the protein in their biologically appropriate diet of raw meat and bones. Carbohydrates are included in the ingredients of processed pet food because they are a less expensive source of energy than fat or protein. How much meat is in your dog’s dinner? Here’s a tip if your only going to feed convenience pet food. If the label states ‘Beef’ then 70-100% must be beef. If the label states ‘Beef Dinner’ then 10-70% must be beef. If the label states ‘Beef Flavor’ then 0-4% must be beef. If the label starts ‘with Beef or contains Beef’ then it must contain at least 4% beef. How is a warrior dog of such magnitude and presence able to exist on this low quality, cheap food waste? Contrast this with your dog’s history as a predator and their natural biological diet. Your dog is now getting all the macro and micro nutrients it needs, right down to the cellular level biology your dog was designed to grow and function from consuming. A naturally fed dog will be protected from infection through a strong and healthy immune system, and if your dog is already suffering from allergies for example, she will recover much quicker and without the need for toxic drugs. What is the Best Dog Food for Pitbulls With Allergies? Here is one example of a Pittbull I worked with who suffered bad skin allergies from commercial pet food. 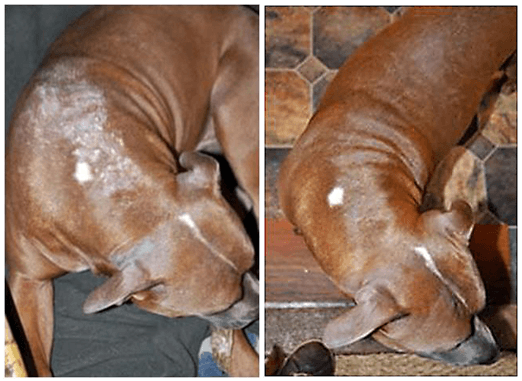 It took about 29 days for this Pitbull to go from serious dog skin allergies to 90% plus healed after returning to his biologically appropriate diet and for his muscles to firm up from previously kibble created flabby soft subcutaneous fat filled muscles. His behavior and temperament also changed for the better as he now became more relaxed and obedient without toxic chemicals surging through his body making him hyper and aggressive. 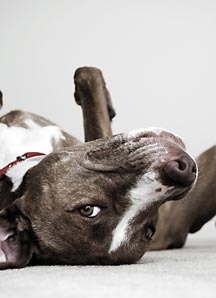 Read more on the pros and cons of a raw food diet, it makes excellent reading and will really open your eyes to what you can achieve with your Pitbull. What dog food is best for Pitbulls – raw dog food wins by a New York mile. Your dog will be stronger, faster and look amazing. Their coat will shine, their teeth will glow white, their muscles will harden up more and look that much more defined. Their ears will be squeaky clean, they won’t smell and their waste will be small hard pellets with little odor, compare that with the stinky dog poo you have to pick up right now. Watch the video below and I’ll explain in more detail. The warrior king eats his warrior food and that food is fresh raw food. It makes him supreme, it makes him even more amazing to behold. Give him the best, because boy does he deserve the best. Honor him with a diet fit for his status, it’s the most vital thing you can do for your Pitbull. 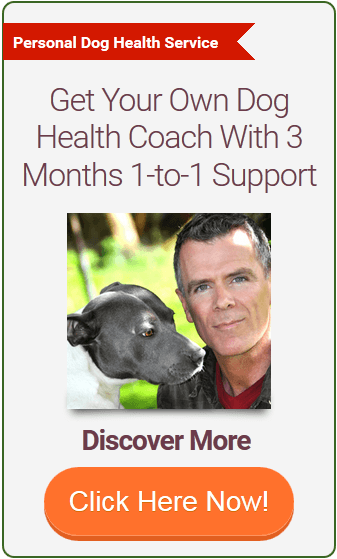 Get my free report below and I’ll help you to help your dog be the absolute best he can be. And share your thoughts below, I’m here to help dog owners and I’ll do anything for Pits. This breed of dog is truly a sculpted, muscular, graceful body of athleticism. To watch this breed respond to commands is truly impressive and majestic. They are such beautiful athletes. No wonder so many people like to breed them. No wonder many people like them as a symbol of strength and bravado. 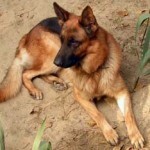 I guess that is why people from impoverished cultures tend to own this type of dog – as a show of strength. Hi Sharon, great description, they truly are beautiful athletes. Yes they are owned for many reasons which is not always for the best interest of the dog. For the most part owners care about their pitts as loyal best friends and I’m here to help with feeding them the best diet possible. 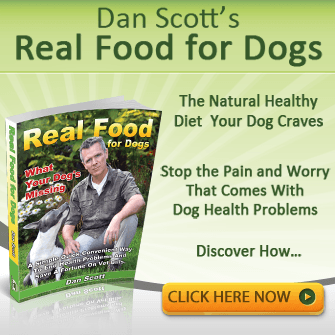 I certainly can vouch for all that Dan has to say in terms of natural diets and resultant healthy dogs. I had a bullpit that recovered from distemper initially feeding her milk, honey, raw garlic, glucose water along with raw chicken mixed with boiled rice until she developed a healthy diet again and began eating the chicken whole. Thanks for commenting Spencer. Distemper’s tough to recover from and meds can make it that much worse as the dogs system has to cope with toxicity when diet and natural remedies work without the toxic damage. Spencer, you trusted in nature and the ability of your dogs immune system to heal itself- that’s how it works folks. I have been avidly reading all I can since I stumbled across your amazingly informative and well researched site yesterday. I wish I had found you 3 years ago, when I took the plunge into feeding our pack of five their first raw meals, with no understanding or support from our vets, or anyone else. I had to go on what I picked up doing internet searches and weigh up the pros and cons on my own. I wavered on occasions due to family pressure and continued supplementing with a high end kibble and home cooked meals, since I had no one to guide me and a lot of opposition. I was so afraid I would harm the dogs long term, even though the benefits were abundantly clear. Just goes to show how brain washed we really are! Thankfully, I now know differently and our dogs are thriving on a fully raw diet. I just wish I had had the courage of my convictions a lot earlier on and had known about this way, long ago, so our previous German Shepherds could have benefitted as well. Our 5 year old male GSD is the picture of health. He was suffering from bad allergies and on Prednisone etc. before the switch over 3 years’ ago. The difference in him has been nothing short of miraculous. Our oldest male, a 10.5 year old rescue mixed breed, sadly has Degenerative Myelopathy, but is steadily holding his own, thanks to his raw diet and acupuncture treatments. The remaining three dogs are 4 year old rescues and glowing with good health. I have been giving them cultured sour milk and full fat plain yoghurt up till now as part of their diet, but having read your views on dairy, I am going to stop that for now and see if I notice any difference. As far as I could tell, they have all tolerated this form of dairy without any problems and apparently relished it. I live in South Africa and wish I had access to the meat selections you are so fortunate to be able to procure at almost no cost, from your butcher. Here things like ox tail, lamb and pork ribs, neck etc. are sold at a premium price. Very little, if anything, is thrown away as scrap meat. We even have to pay for the bonemeal that is generated by the sawing up of the meat, and even stripped bones are sold by the bag! We have a great raw food supplier, and do the best we can by supplementing what we get from them, but it costs an arm and a leg. Rocco is such a beautiful boy! I loved seeing him flexing his muscles in the video you produced on how to make liver treats. We do those as well and our dogs are crazy about them, too. You sound as though you had the ideal boyhood and look the picture of health and vitality yourself! A great advertisement the two of you make for going all raw. Thank you for sharing your knowledge so freely. Hi Des, Thanks for your detailed reply and story. I understand your dificulties in SA getting various food types and the cost, having spoken with other dog owners there via email. We all have back stories about something we wished we could have changed, but that’s all part of learning, so never worry on past mistakes, put all your faith in present moment awareness and go boldly ahead. Yes, milk products – my best replacement for those would be raw green tripe. If you can get it, it’s fantastic food that’s nutritionally balanced and full of good bacteria, gastric enzymes and so on. 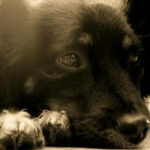 If your dogs need the extra calories from soured milk and yoghurt, stay with it in moderation. It’s not needed, can produce sludge on the gut wall and a few other things but sometimes we use what we can get and it has to do. Your dogs overall diet is what counts and it sounds like you have things going well. 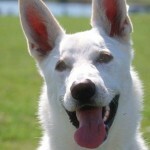 Yes, Rocco loves his liver treats and 100% success with other dogs so far. And thanks, he’s in great shape and I still very much love watching him play and eat. Back on the farm in Australia as a young boy I watched my dad feed the sheep dogs and my dog with the raw waste from our own food animals – nothing wasted. That was my grounding in how to keep dogs healthy and I do practice healthy diet and exercise myself, just feels good to do so.